Add a sturdy, adjustable depth shelf into almost any server rack or cabinet. 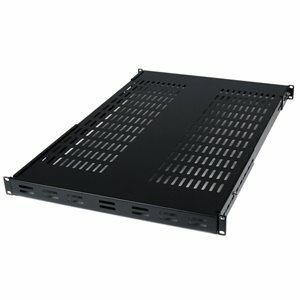 The ADJSHELF Adjustable Mounting Depth Rack Mount Shelf offers a simple way to effectively organize mission critical computer hardware in your server racks and cabinets.Compatible with all 19in (wide) server racks/cabinets, the fixed rack shelf can be adjusted from 19in to 38in (mount depth) as necessary. A sturdy cold-rolled steel construction provides long term durability and enables a weight capacity of up to 175 lbs (80 kg). Add a sturdy, adjustable depth shelf into almost any server rack or cabinet. Compatible with all 19in (wide) server racks/cabinets, the fixed rack shelf can be adjusted from 19in to 38in (mount depth) as necessary. A sturdy cold-rolled steel construction provides long term durability and enables a weight capacity of up to 175 lbs (80 kg).